Ordinal numbers describe an order/rank. - you add a -u after cinq to form cinquième, as the syllable "qi" doesn't exist in French. - the -f of neuf becomes a -v in neuvième, simply to ease the pronunciation. Je préfère la première robe. I prefer the first dress. Il a fini le troisième exercice. He finished the third exercise. Je suis arrivé sixième au marathon. I came sixth at the marathon. J'ai réussi la neuvième fois. I managed the ninth time. When to use deuxième vs second/seconde ? On aime la deuxième chanson de l'album. We like the second song of the album. Il y avait deux gâteaux sur la table: j'en ai mangé un, tu as mangé le second. There were two cakes on the table: I ate one, you ate the second one. - Use second/e if there are only two options. 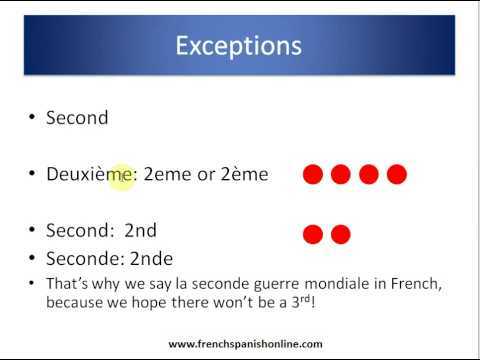 In the video, you have 3eme, 4eme, 5eme whereas in the lesson you have 3e, 4e, 5e... are both used or is one used more frequently or is one more formal than the other? I think it would be useful to note in the lesson another small exception to the rule on forming the ordinal numbers. Namely, 'cinq' becomes 'cinquième' rather than 'cinqième'. No big deal, but I just wanted to mention it. Bonjour Scott et merci pour votre suggestion très utile ! Joakim asked : why one says "tiers monde" rather than "troisième monde" ? Bonjour Joakim ! ​The expression "le Tiers Monde" to say "the Third World" is fixed as it is in English: this is the only way to say this in French. ​"Le Troisième Monde" would feel like there are more than one world, i.e. one planet, when here it's more of a division of the world into three "parts", hence the use of the fraction here. À bientôt !